The IPSC10 screw style clamps are for positioning, pulling and turning plates or fabrications. They feature a forged alloy steel body for strength and smaller size, with forged alloy components where required. They are suitable for steel with a surface hardness up to 30 Rc. Each clamp is individually proof-tested at 2 times the Working Load Limit with certification, and is individually serialized with the serial number and proof load test date stamped on body. 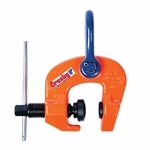 The company name (Crosby IP), logo, Working Load Limit and jaw opening are permanently stamped on the clamp body. Manufactured by an ISO 9001 facility with a design factor based on EN 13155 and ASME B30.20.